Since long I have been thinking about returning to serious blogging and last week an issue did come up which presented that opportunity. However, thanks to my laziness, I kept procrastinating but finally I am here dishing out my humble views on the issue which has created a slight furor in the political arena though the rising onion prices has relegated it to the back burner. Nonetheless, it is an issue which will keep returning and haunting this country. Wikileaks which was turning out to be an embarrassment for the American government reached the Indian shores with the news that the Yuvraaj Rahul Gandhi thinks that Militant Hindu Nationalism is a bigger threat to India than the terrorism being perpetrated by militant outfits like LeT. Well, Yuvraaj ji, though I hate Dynastic politics and hence I am no big fan of yours, still I agree with this statement of yours because I tend to think objectively. First of all, Rahul never said that Islamic Terrorism is not a threat to India. In absolute terms it definitely is and one should note that during the above mentioned candid admission of Rahul to the US Ambassador, he had also admitted that there is evidence of some support for LeT among certain elements in India's indigenous Muslim community too. Maybe, this statement lost its importance in the entire furor created by the other big statement. According to Rahul, it is on relative terms that Militant Hindu Nationalism becomes a larger threat to India. But then one will argue, can we quantify the threat while talking about terrorism, whichever hue or colour it might be having, here ofcourse green versus saffron. Definitely, you can’t. Terrorism in any form is equally threatening. So why do I say Rahul is right? It’s important to look at the overall consequences of the actions perpetrated by Militant Hindu Nationalists and the situation arising from such violent polarization of the society. It is this situation that poses a bigger threat and that’s what Rahul meant when he spoke those words. How am I so sure if this is what he meant? Well, because I hold the same views and hence, somehow I can gauge the sentiments behind the statement. Opposition keeps accusing Congress of indulging in Muslim appeasement. However, the fact remains that appeasement never leads to actual upliftment of the community being appeased. Hence, the situation of Muslim community remains as abysmal as it was. Findings of Sachar Committee Report substantiate this fact. Ofcourse, the community feels cheated by both the sides, those who allegedly appease and those who accuse them of doing that. In such a scenario, certain sections within the community are definitely going astray. However, to catch hold of these sections is not that difficult for the simple reason that they are a minority within a minority and those responsible for catching them largely come from the majority community. Then why they don’t get caught is a different story linked to the so called minority appeasement by those in power. Anyway, without going off topic, I must tell you why I brought this up. Now think of the terrorist activities being committed by those who comprise a minority within the majority, i.e., Militant Hindu Nationalists. Here sympathies of those responsible to catch them might hinder them from doing their duty. I am by no means questioning the honest police officials but then there are black sheep in their ranks and frankly, many of them as we all know. What happened in Gujarat is known to all. You may keep on prolonging the investigations but the horrendous stories that came out couldn’t be someone’s figment of imagination. Hence automatically, militant activities being committed by those sections which come from the majority community become bigger threat. The polarization it creates is even bigger as now the minority community tends to feel even more insecure and hence, those from amongst them supporting groups from across the border increase in proportion. The situation can only worsen from here. It is this situation being created by the Militant Hindu Nationalism that is posing the biggest threat to India. The terrorism from across the border can be tackled by the mere patriotic conscience against it but that being bred in the name of religion within the country by the majority community may go out of hand. So to sum it up, Militant Hindu Nationalism is a bigger threat to India’s integrity than the Islamic Terrorism being perpetrated from across the border. Period. In a class some days ago, I was discussing similar issues with the students. There was one student who kept negating my stand on little being done for Muslim community and threat from Militant Hindu Nationalism. To some extent it was irksome but overall he was a very intelligent and responsive student. While taking the attendance, I realised he was a Muslim. Before leaving the class, one student asked me that what is the biggest example of secularism in India? Though, I just replied that it is the fundamental right to freedom; I actually wanted to say, see how I, a Hindu is accusing the successive governments of doing little for the Muslim community and talking about threat from Militant Hindu Nationalism and this student, a Muslim is constantly negating me. Militant Hindu Nationalism is the biggest threat to this very secular fabric of my nation. 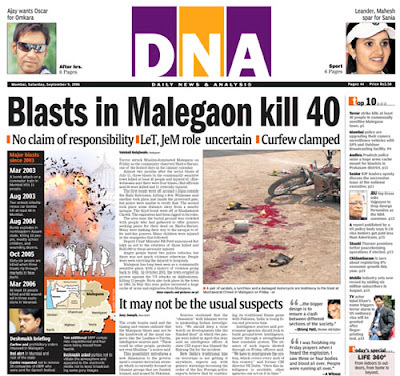 A news report about Malegaon Blasts (2008). The investigations led to the unmasking of the ugly Militant Hindu Nationalism. Terrorism per se is de3plorable..period. but summing up like this a very complex issue in two lines is being very naive and may be a hardliner too..sorry to say but very dissappointed. "It’s important to look at the overall consequences of the actions perpetrated by Militant Hindu Nationalists and the situation arising from such violent polarization of the society. It is this situation that poses a bigger threat and that’s what Rahul meant when he spoke those words." Can you give example supporting ur arg where they were bigger threat than LeT? Terrorism is a THREAT - from whosoever it comes! One can never say that a particular terrorism is much better than the other! But with so much of freedom in India - Yuvraaj saying this to US Ambassador is irritating. Rahul should say it openely (if he feels so strongly about it) and face the consequences! That is the right way to proceed. No one can justify the comments of RahulG. Why did have to speak on this subject to American Ambassador?Being an MP, did he speak in Parliament? Did he complain to the Home Ministry?Did he take up the matter with the PM? Since you have written on the subject, Do you. also think RSS and SIMI are similar org? Which Hindu will accept this height of idiocity and stupidity? Well, well, well.. some nice fodder for my thoughts.. thnx 4 supporting Abhilash bt more importantly thnx evryone else 4 d criticism.. Now let me answer each of you..
@Renu.. Naive.. i dont think.. mayb u c it as a complex issue and I c it in vry clear terms..
Hardliner.. technically speaking not possibl as being a Hindu, criticising the hardliners in my own community dont make me a hardliner.. Calling me a hardliner.. naive ofcourse!!! @Ravichandra.. I think I have presentd my case in clear terms tht why one is bigger threat thn the othrs.. And the articles u present also dont negate my stand as they refer to Let's activities in absolute terms and not in relation to new extremism rising amongt Hindu middle classes.. Still repeating my explanation.. Tackling foreign terrorists and their sympathisers amongt the citizens is less difficult than tackling a situation where the govt also has to concentrate on militant activities of a group frm majority community having more 'stupid' sympathisers in numbers..
Mark the word SITUATION in my argument!!! @Savita.. This is what you said - Terrorism is a THREAT - from whosoever it comes! One can never say that a particular terrorism is much better than the other! This is what I said - Terrorism in any form is equally threatening. So we both agree, right..
Again I'll repeat, I talk about the overall consequences of this brand of terrorism and not just about their activities or ideology..
Mark the word CONSEQUENCES in my argument!!! And as for speaking out openly, well now Congress has done so in their latest conclave though naming RSS is naive.. they should have stuck to 'militant nationalism' in its abstract form. @Chowlaji.. The questions u raise ofcourse need to b answered.. The part of furor tht pertains to why Rahul shared sch apprehensions with US ambassador and not with Home Ministry is plausible.. thn mayb some 'wikileaks' frm amongst our ministeries might reveal tht he actually did so..
And then u go on 2 say sch statemnts bring out differnce b/w two communities.. mayb this was the reason he didnt made this assertion openly.. In short here u r contradicting urslf.. Remember, these are wikileaks.. they wer nvr meant to go public!!! Wikileak was not orchestratd by Congress.. so again whn u say sch statmnts r part of minority appeasmnt, I find the argumnt vry weak!!! Do I think RSS and SIMI r similar.. I jst mentiond above in rply 2 Savita tht Congress shud not have named RSS. And Rahul nvr did so, he stuck to militant Hindu Nationlaism.. Abhinav Bharat is the right example. I am a Hindu and I do!!! I could say nationalism is a serious threat to the gov't since they could enable to maneuver and penetrate the silent majority of the masses who wants changes and development, and if they could conquered the heart of the masses that is the time you can see mass action in all over the street against the government until the gov't itself become weaks that easily to be overthrown. Terrorism is not the threat because they don't have any support from the masses, instead they only act and move by themselves, they could easily conquered because they don't have any mass base to support their movement. i agree that militant hindu nationalist is a threat, as the wind around will always be against Muslims. Now these cool chaps, will always have the chance to act in disguise. Well Windel, the problem is these terrorists are getting the backing of certain sections of nationalists or rather these terrorists hav emerged out of sch so called nationalist outfits only.. Moreover, there is no lack of sympathizers for sch ideologies.. Riots that have rocked this country in evry decade since last 30 yrs r a proof of the same!! Going off topic, let me add that what happnd in Ayodhya in 1992 is a bigger cause behind the rise in terrorism than Pakistan's covert actions. And all this happened in the name of Hindu Nationalism!!! Welcome back to blogging buddy. here in this post, simply I agree with you. that exactly is my stance. Vipul, I disagree with. I think u r preparing yourself to recv "baksheesh" from conparty afficionados....the kind generally doled out by congrooks to "pliable and obedient" "journalists"! Whatevr I might b preparing myslf for, I hav guts 2 air my views openly.. So Mr/Ms 'spineless'Anonymous, gt tht thing straight!!! I will not get into an argument with you on the issue.Obviously, you as much as I have a point of view and and I can see that we are on different track with a different mind set. I am not contradicting myself, that is how seem to like to read the comments. I would request you once again read my comments and you will realise that I have been very consistent in my stand. Yes,we have different views which I respect. @Magiceye.. Well, ofcourse terrorism is terorism.. one cant compare one form with other per say.. bt larger picture needs to b seen..
Hinduism is an eternal cultural revolution and not a religion. It is known for its openness and has always adapted itself since the Vedic ages. New influences, ideologies and cultures have arrived from outside and many new have taken birth inside but Hinduism has always embraced them and coexisted with them. There is no scope of so called fundamentalism as Hinduism never propagated any fundamentals. I believe in this brand of Hinduism. @Vipul ji, It is sad to see ,an intellectual like you to have omitted what David Melford had criticized about the Congress action on removing the Home minister, just after 26/11, so that not much damage was done to the party. It is an irony that in India the politics runs around appeasing certain sections from time to time for votes and party upheave ling. By dividing terrorism into different sections and naming them , we just weaken our fight against terrorism, which is just one ,taking away innocent lives. Why can’t we have the guts and unity to utter like Gerorge Bush, after sep 9th incident, those who are not with us on this cause are with the terrorists. And will be dealt with harshly. There is no point in blame games,. The need of hour is to have super stringent measures no matter how v.i.p. one is, and any utterance breaking communal harmony should be heinous crime and any bloody person who can think of putting the nation at stake should be served in the right place. We are all one and will remain one, any one thinking differently should be shown the way. Pramod.. I have no idea, how this post contradicts what u hav said here.. frankly, i stand with each and evry statement of urs except the one praising Bush as his war against terror had far too many errors..
And again, i don't undrstand if I support one statement of Rahul Gandhi tht is construed as my support for Congress. Can't we be objective and support or dismiss individual stands or statements of a politician without being called supporters of his/her party. This post is just to convey a simple message that just like so called Islamic terror exists thr is a new threat rising, that of militant hindu nationalism.. Those supporting such militant ideologies are jst a fraction of the whole community bt end up tarnishing it as a whole. Some just turn a blind eye to it but I cant stand my faith being tarnished. Do read my latest post. Vipul, whatever written ,is interpreted differently by different minds. Like you took my statement on Bush, to be praising all his actions, but what I meant was only the boldness and guts to challenge the whole world. His actions were totally different and biased in ground reality, in fight against terror. Likewise your supportive comment on Rahul, here gives the same idea. Whatever comment made by any person of authority, which sparks off a disturbance in communal harmony, should be condemned.terrorist of any religion should be in just one category, and dealt with strongly. by naming them in to different sections new mob calamities ensue, as a result more terrorists are born. Pramod I agree totally.. but rmember unike his cousin Varun Gandhi who made communal statements publicly during last elections, Rahul made this statement privately. So I fail to undrstnd how can he be blamed for wikileaks..